Makes a great gift! Limited availability. Approx Sizes:1"L x 1"W x 1"H.
We specialize in blind box toys. Because we have many available. Sword Kirby. 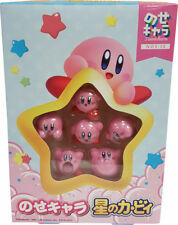 A lot of 5 Kirby of the Stars finger puppets from 2006, made by Tomy/Subarudo and imported from Japan. Spark Kirby. Fire Kirby. Authentic Ice Kirby Nendoroid from GSC w/ Sealed Preorder Bonus. Box is in good condition with minor natural shelf wear. This is a boxed Fire Kirby keychain. It has not been opened. FROM: BANDAI. SERIES: BEN 10. Doing that is against U.S. and international laws. APPROX SIZE: 3 1/2" TALL. Do not select Buy Now. The item includes only the things you can see in the picture. Contents, is a thing that is reflected in the photograph. For example, if there is an exhibit such as "item 5 piece set", it counts as one item. These are very cute and made of a hollow, but firm, plastic (they don’t squish). When removed it left a tiny hole on the top of their heads, this was by design. I tried to take a picture of it, but it may be too small to see in the picture.